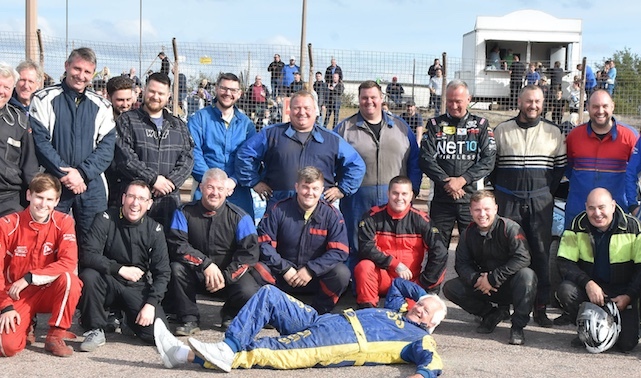 WITH Arena Essex’s closure fast approaching, there was another significant moment in the tracks history on Sunday as the final ever Terry Skeef memorial meeting at the venue drew a massive entry of cars, on the 18th anniversary of the Banger racing legends death. Paul brings with him a wealth of knowledge and experience and is armed with excellent coaching achievements including producing 50 County swimmers and in excess of 30 Regional swimmers annually; developing over 25 individual national qualifiers, national finalists and semi-finalists and developed squad swimmers who have qualified at the British Championships in 2009 to 2014 including Olympic and Commonwealth Trials. TABLE Tennis has always been popular in Aveley. They have a regular club every Saturday for adults in the morning and for young people in the afternoon. The afternoon members wanted to play competitively and, as they say, practice makes perfect but they needed some help. As part of the S106 funding given to Aveley Village Community Forum they were able to start professional coaching for the young people. SWIMMERS from Thurrock Swimming Club showed their determination to compete at the recent Essex County Junior/Senior Long Course Championships following the sad death of their Head Coach, Alan Mitchell but did him proud by returning home with a bag full of medals. IF YOU WANT to learn karate with a smile on your face, then The Thurrock School of Karate is the place for you. Rex Ovire is a charismatic practitioner of the art. Then again, we would say that, he is well over six feet and is a black belt! SHIHAN Mark Adams started teaching karate 23 years ago and now has 150 students who train across eight locations in the Thurrock area, including at local schools. With a focus on competing from an early age, Mark has trained local, national and even world champions. The first heat set the tone of the day with a packed grid of cars whittled down in just a handful of laps. The race was brought to a halt with a rollover at each end of the track, Jimmy Andrews doing a spectacular barrel roll on turn one whilst for the second time this season, Sharon Worthington did a lazy roll onto her roof on turn three. At the restart Craig Hook took his first win in the formula. TWELVE swimmers from Thurrock Swimming Club took part in the first ever Speedo Open Water National Relay event held at INTU Lakeside on 22nd September 2013 with fantastic results. The Thurrock Teams competed in the 4x200m and 4x800m relay events, with the majority of TSC swimming without wetsuits in less than 16 degree water and thoroughly enjoying the event. THE THURROCK Tennis club enjoyed a great summer as a host of youngsters came to learn how to play and how to enjoy tennis. They had 65 youngsters over three weeks with ages ranging from 4 to 16. INTU Lakeside in Essex hosted the first Speedo Open Water National Relays on Sunday 22nd September and judging by the fantastic response to the innovative concept it is a team event which is likely to grow in popularity in years to come. COULD THE next Andy Murray be in Stifford Clays or Purfleet? Why not go down to Thurrock Lawn Tennis Club to develop your cross court lob or your backhand smash! ARENA Essex Lightning Rod regular, Chris Reeves has just completed the most successful weekend of his career. Off the back of a win and a second place finish at the long track championships at Lydden Hill on Saturday, Chris won the heat and final at his more regular Thurrock stomping ground on Sunday. Swimming: Kieron smashes national records! The journey was definitely well worth it for the talented 11 year old who not only claimed two Gold medals in the 50m and 100m freestyle long course events, but also broke and recorded National records for his age group. Historical record times were 44.06 and 1.57.52 until Kieron broke them both with 39.32 and 1.28.49 respectively. The final saw a full contact win from Darren Mouser, who despatched several along the way, including David Newman who had a torrid time along the home straight, getting hit several times as he spun in traffic. Jamie Webb lead for much of the distance but eventually went out with a big bang on turn one along with a handful of other cars. As Mouser took the flag his front tyre shredded, with pieces of rubber getting flung into the air. If the race was a lap longer, Grant Underhill would have had the win, as it was he had to settle for second with Paul Harrison third. THURROCK Swimming Club held their yearly Regional Qualifier recently with over 40 of their squad swimmers taking part. What a difference a year makes from the last Regional Qualifier in May 2012, seeing swimmers step up to the mark with an abundance of PB’s and medal podium places. Georgia, a Thurrock Swimming Club National Age Group swimmer, competed in the gala representing East Anglia, previously representing St Johns School, Billericay in the heats back in November. On a day packed of events, Georgia competed in the 4 x 50m individual medley relay in which she swam the butterfly leg and the 4 x 50m freestyle relay. Georgia’s individual races were the 50m freestyle and 50m butterfly. YOUTH swimmer Matt Winnell had a successful East Region Youth Championships in Luton over Bank Holiday weekend. The dual registered Thurrock Swimming Club youngster had a winning weekend by securing his first National qualifying time of the season in the 200 backstroke (2.11.93). Thurrock LTC have now joined the Brentwood League (midweek) and played their first Mixed Doubles match against Writtle. Thurrock drew 4-4. Thurrock team members Kathryn Westcott and Terry Morgan lost both their matches although the team had suffered with injuries, whilst Diane Morgan and Gavin McAlear won both thier matches. The following week our Mixed team played Hutton and Shenfield. Thurrock drew 4-4. Mia Lan and Terry Morgan lost their matches but was a very close match. It was Mia’s first experience in the mixed team and she played a fantastic match. Diane Morgan and Danny Svendsden won both their matches. Arena Essex: Sixty national bangers create havoc! The SuperBangers saw the honours split between Karl Douglas and Lee West. John Harris blew the engine on the Steve Davies car in the first race which saw a huge oil trail which caught out Louis Parker on the final lap, although he spun without damage. This turned out to be the best race of the day with Douglas just failing to dislodge West from the lead on the last corner. THE Grays Yamaguchi Goju club did well at the recent SRK Spring open Tournament at Gateway Academy, Tilbury, Richard Hang Hong the Tournament organiser was pleased to announce that he had record number of 250 students competing. Leading the way for TSC was James Speers who dominated the nine-year age group, claiming nine championship titles (50 Fly, 50 Breast, 50 Free, 50 back, 100 IM, 200 IM, 200 free, 200 fly, 200 breast), and a silver in the 200 back. Speers also recorded an event best time in the 50 free (32.47). The versatile youngster was also crowned top nine-year-old boy. Another TSC swimmer competing in their first County Championships was Gracie Mae Martin, nine. THREE young students of local martial arts club Seitou Ryu Karate managed to win gold, silver and bronze medals in the AMA Southern Open Karate Championships held in Clacton-on-Sea on Sunday 14th April. Emma Ludkins, 10, brother Tommy, 9 from South Ockendon and Adam Baglin, 10 from Chelmsford, beat over 20 other competitors in the 4th Kyu and below junior division for kata (forms) to secure first, second and third placings. In addition to this, Emma & Tommy also secured additional 2nd and 3rd placings in their own separate girls and boys kumite (sparring) divisions. A BRUTAL Destruction Derby capped a magnificent day at Arena Essex last Sunday as the National Bangers provided many a highlight. It was a fairly gentle start to the meeting, with the entry split into two for the opening heats. Spedeworth visitor Alec Savage and Scott Cornish took the wins whilst each bend did attract some action with the pit bend seeing the destruction of the Ford Focus of Pete Bristow, courtesy of Jason Jackson, whilst turn one saw a heavy exchange as Jim Harding run in Andrew Milner, Harding then getting destroyed by Liam Hard, Hard in turn getting comprehensively finished off by hits from Nathan Roberts and Ricky Hutton. Hard’s debut at Arena being shortlived but enjoyable. NEARLY all of the Cedar Hall Osteos sponsored sportsmen and women are track and field. One exception is local Stanford boy Sam Dixon. Sam is a mixed martial arts fighter and he is making his way up the rankings.